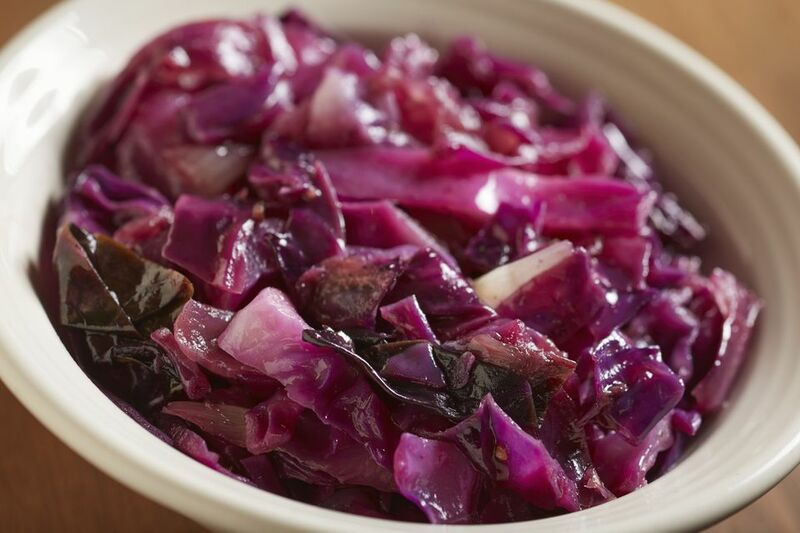 This colorful side dish for Crock Pot Red Cabbage and Onions pairs perfectly with Apple Pork Chops or any simple pork chop recipe. You could add a chopped apple to this mixture if you'd like. Red cabbage is sweeter than green (or white) cabbage and has such a beautiful color, even after it's cooked. These veggies have lots of cancer-fighting nutrients. You can find cabbage year-round at the grocery store. It's such an inexpensive vegetable, and it's so good for you. To prepare a head of cabbage, first, rinse it under cool running water. Then, using a sharp butcher's knife, cut the cabbage in half through the stem. Cut the stem and surrounding thick leaves out of both halves. Then turn the cabbage cut-side down and slice. Cut the slices to form pieces that are about 1/2" square. Red onion is another healthy vegetable. It is sweeter than yellow onions and can be found in most produce departments. Its shelf life isn't as long as yellow or white onions, so use it within a week. Tip: You can double this recipe if you'd like; just use a larger slow cooker. Remember to always fill crock pots 1/2 to 3/4 full for best results. If there isn't enough food in a crock pot, the food may overcook and burn. If it's too full, the food may not cook in the allotted time, or it may overflow the appliance. Remember that foods have water that leaks out during cooking, and there's no evaporation in a slow cooker. Spray a 3 to 4 quart slow cooker with nonstick cooking spray. Combine cabbage, red onion, and garlic in the prepared slow cooker. In a small bowl, combine vinegar, sugar, salt, white pepper, and water and stir well to dissolve the sugar and salt. Pour over the cabbage in the slow cooker. Cover and cook on low, stirring twice during cooking time, for 6 to 8 hours until cabbage is tender. Serve immediately.